Ryan Gilmore is an award-winning screenwriter who specializes in horror and thrillers. He won the UCLA Professional Program Screenwriting Competition as well as numerous horror film festivals. 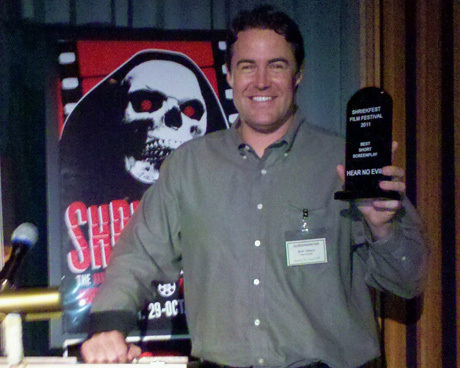 Most recently, Ryan won “Best Short Screenplay” at the 2011 Shriekfest Horror Film Festival for his script titled HEAR NO EVIL. The short film HEAR NO EVIL completed principal photography in September and is currently in post-production. Ryan also judges various screenwriting competitions, including the International Horror and Sci-fi Film Festival. He recently launched a horror and thriller script consulting service at www.screamwriting.com. In this issue, we conduct a Q&A with Ryan, a graduate of the UCLA School of Theater, Film & Television’s MFA Screenwriting Program, on his experience breaking into the entertainment world and his day to day tactics as a new writer.